Then, again like many expats, work got in the way, other distractions mounted up and getting my scuba certification kept getting shuffled to the bottom of my long to-do list. But now, years after my arrival in Phuket and with the peak diving season upon us, I decided I could procrastinate no longer. 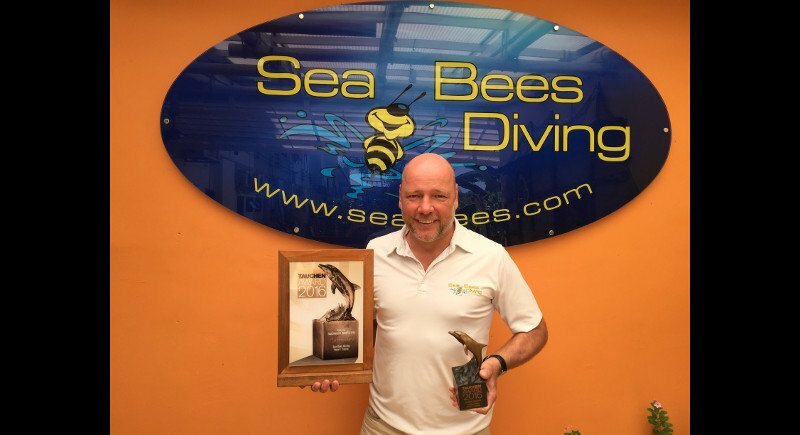 So I bit the bullet and signed up for a scuba training course with Phuket’s Sea Bees Diving – a long-established dive company that has been running trips in Phuket and other diving hotspots in southern Thailand for over 20 years. 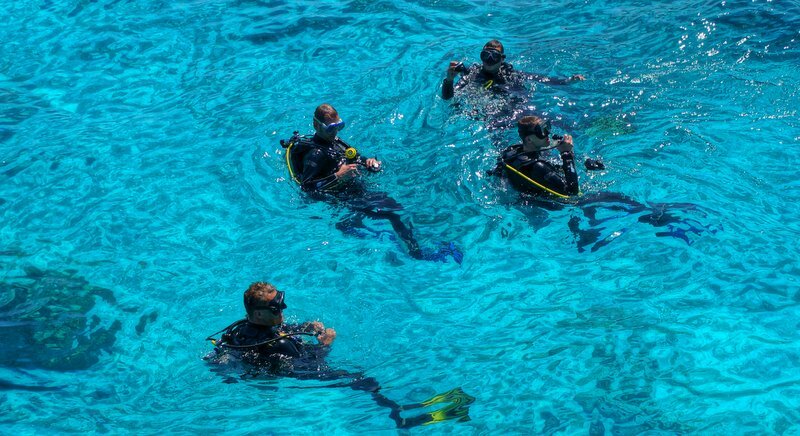 After a bit of research on their website, I decided that the three-day Scuba Schools International (SSI) Open Water course seemed like the perfect fit. 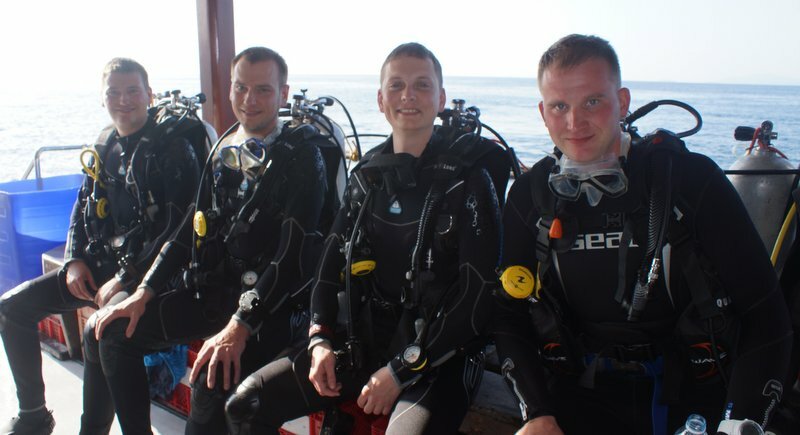 After the three-day course you obtain the internationally recognised SSI Scuba Diver certification which enables you to dive up to 18 metres deep and which can be easily upgraded to the SSI Advanced Adventurer certification with additional training – allowing you to dive up to 30 metres deep. 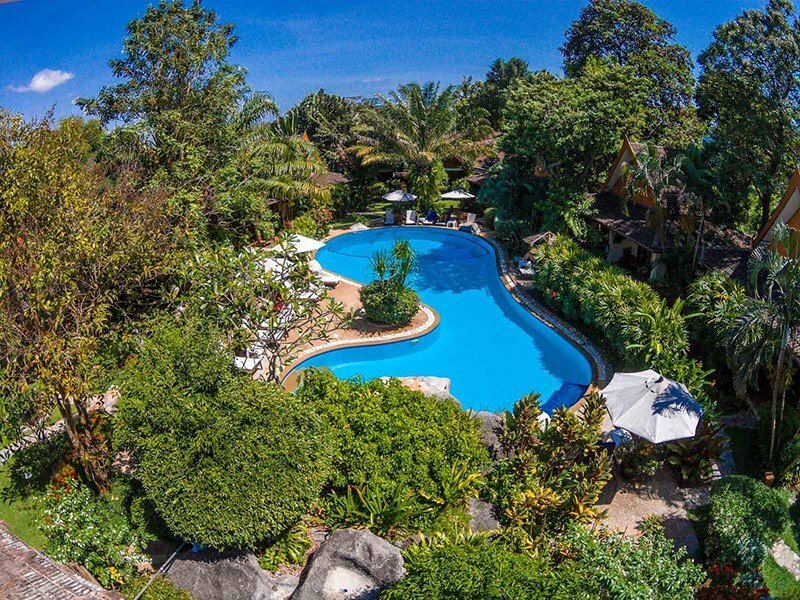 So, after a quick phone call to the Sea Bees Diving office in Chalong to confirm the dates for my course, I was all set to go for my first day of basic training in their dedicated practice pool. 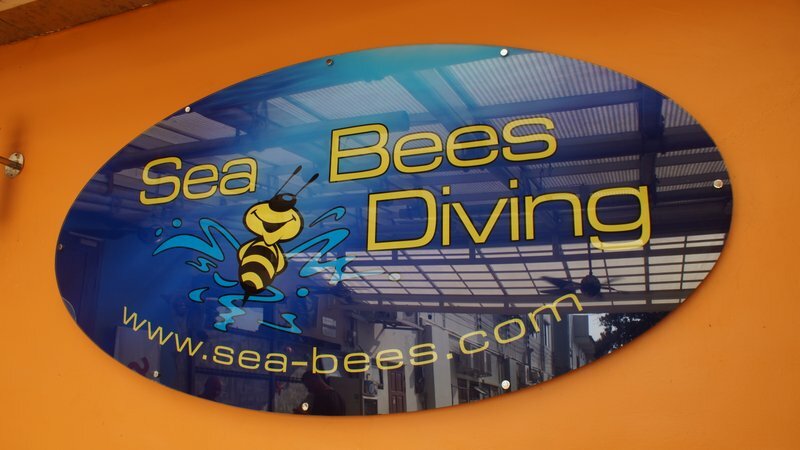 Sea Bees prides itself on keeping a ratio of two students per instructor, but due to a stroke of luck and scheduling, I was able to do my training one-on-one. My instructor Alex, a friendly young man from Belgium who was a natural teacher, made the course seem like a breeze. 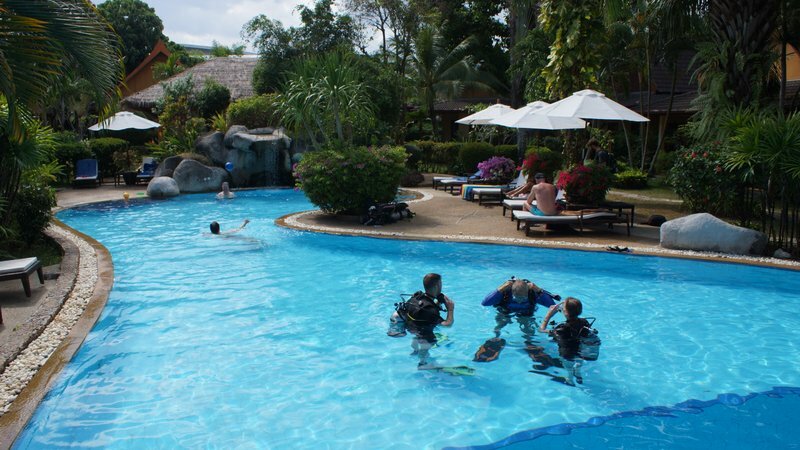 The first day in the pool was an introduction to the basics of using scuba gear safely, learning hand signals, the dive buddy system and maintaining control of your buoyancy (one of the trickiest things to get a handle on, but perhaps the most essential skill for scuba diving). Alex was a great instructor, explaining each new technique in clear and simple terms, and before long I felt I had a pretty good feel for the basics and was itching to get out on the boat for my first open water dive. That evening I read up for my SSI exam on scuba diving theory. One of the best things about the SSI course is that you can access all of the course materials through their dedicated app. Once you sign up, you can use the app to log all your dives, study technical diving information and take a practice test. At first I was worried that the scuba theory might be quite difficult to master, but it turned out to be easier than I thought and I managed to pass the test quite easily. 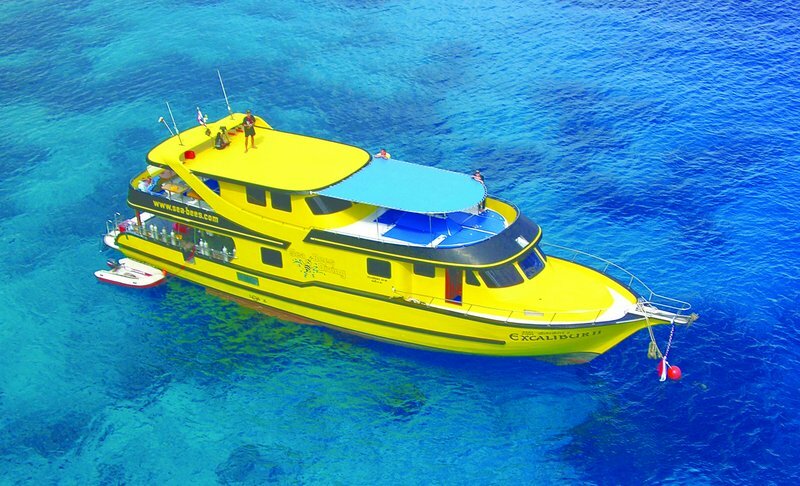 I was up bright and early the next morning at Chalong Pier to board Excalibur II – one of Sea-Bees’ distinctive bright yellow boats – and we were soon on our way out to Koh Racha Noi for our first dive of the day. 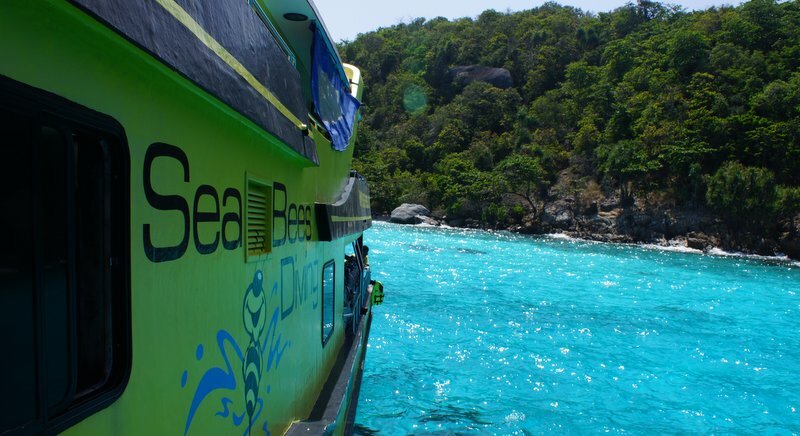 Everyone on board enjoyed a tasty hot breakfast and got to know each other a bit as we cruised through the beautiful aquamarine waters of the Andaman Sea. 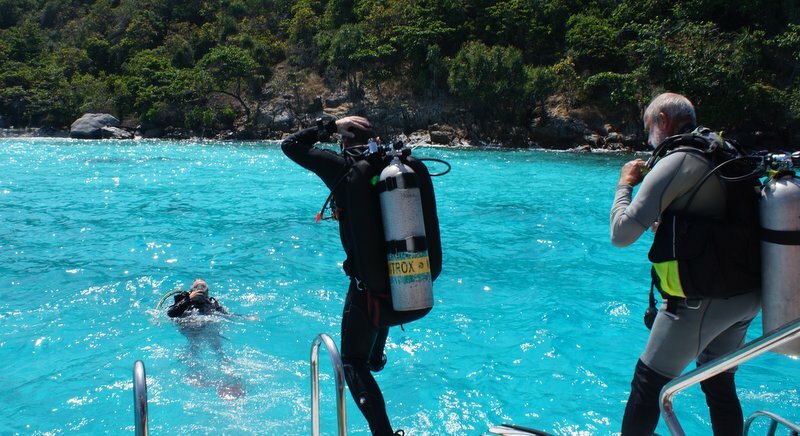 When we arrived at Koh Racha Noi Alex helped me get suited up for my first dive. This first dive was very much focussed on re-enforcing the techniques I had learned in the pool the day before – but they seemed a lot more daunting when I was 10 metres underwater! The hardest part was air sharing and the emergency ascent drill. It is not a comfortable feeling taking out your air regulator when you are so far underwater. But I felt I was in safe hands with Alex and the more times we practised the more confident I felt. Also throughout this first dive we practised hand signals – the only form of communication you have with your dive buddy – another crucial skill to master for safe diving. The importance of mastering buoyancy control by carefully regulating your breathing becomes clear when you’re diving in open water. More than a few times I had trouble either floating up too high or sinking down too fast – but as the day went on, I got better and better. 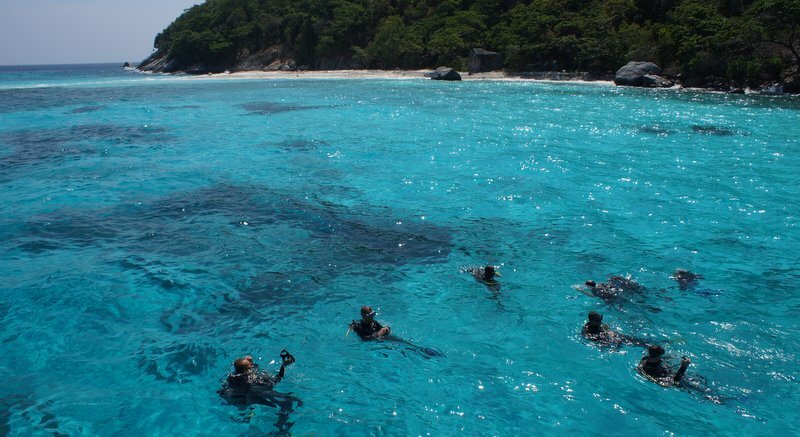 For the next dive we headed to another popular beginners' dive site on the other side of Koh Racha Noi. This second dive was where the fun really started, my confidence was up and I felt comfortable gliding over the coral spotting sea life. Again, Alex was a great help here, constantly pointing out elusive animals I would have completely missed otherwise. On this dive I saw a moray eel, an octopus, giant clams and countless species of reef fish, my favourites were the brightly coloured parrot fish. Alex also pointed out many nudibranchs – tiny slug-like creatures that come in a dazzling variety of neon colours. We then headed back to the boat for a delicious and well-earned lunch while we cruised to our final dive spot of the day at Koh Racha Yai. Soon we were back in the water and after practising a few more techniques we began to explore the nooks and crannies of the reef to see if we could spot more creatures. 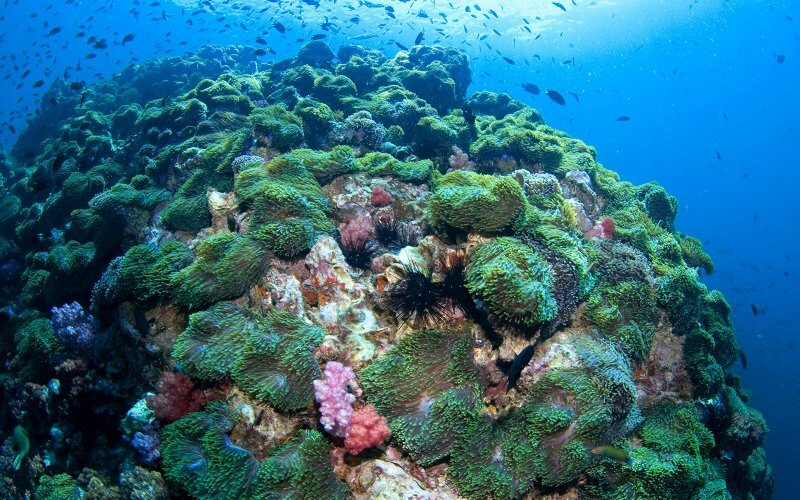 I had my eyes firmly fixed on the coral below me as I suddenly felt Alex grab me and begin dragging me back from the direction I was heading. My heart rate shot up and I immediately thought "Shark!" But Alex quickly pointed towards the slightly less serious danger – a large, angry-looking trigger fish that was heading straight for me! He was clearly displeased that I had intruded his territory. Alex had warned me of this particular species’ aggressive behaviour when gaurding their territory and I was glad he had been keeping a close eye on me, otherwise I wouldn’t have realised until I was bitten. After that bit of excitement it was time to call it a day and board on the boat for the trip home with a few ice-cold beverages to celebrate my first foray into the underwater world. I passed the time chatting to Alex and several of the other freindly young instructors about what it was like to have such an amazing job and where else they had worked and dived across the globe. The final day of the course was great as we got to dive in some quite different conditions at each dive. 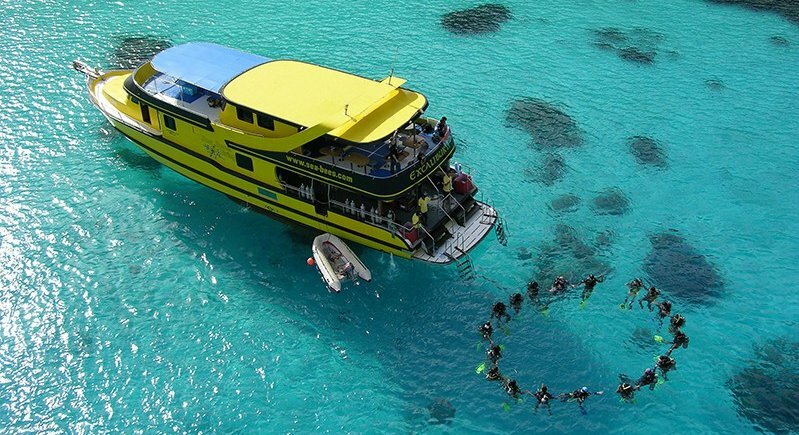 At one site there was a current that helped you to glide effortlessly over the reef as if you were flying. You quickly realise the immense power of sea currents, and it was even a little scary at first, but once I got the hang of it it was amazing fun. The final day went even quicker than the first and I was beginning to feel more and more confident moving about in the water and in my knowledge of safety skills and techniques. As I watched a group of more advanced divers sink further into the depths to explore , beyond my 18-metre limit, I felt a twinge of jealousy. I silently resolved that I would definitely be coming back to get my Advanced Adventurer certification and try some more adventurous dives. Before I knew it, the final dive of the day was over and we were heading back to Phuket as the sun began to set. Again, I eagerly chatted with Alex and the other instructors about some of the other dive sites I could visit when I came back to get my Advanced Adventurer qualifications. All in all it was a fantastic experience and a perfect introduction to the world of scuba diving – I can’t believe I waited so long to do it! It’s easy to see why Sea-Bees has been around for so long, and has such a good reputation, the whole course went like clockwork and the instructors and boat crew were super-friendly and helpful. I can’t wait to get back in the water again to obtain my SSI Advanced Adventurer certification this season and hopefully even doing a night-dive or a wreck-dive. So, if like me, you have been constantly putting off getting your scuba certification, then stop making excuses and book your course today! Trust me, you won’t regret it.